Titanium is as strong as steel, nearly half its weight, and highly resistant to corrosion, which makes it a highly desirable, cost-effective choice for industry, especially defense and aerospace. 30% or better strength to weight ratio over aluminum or steel. 40% lighter than steel, high tensile strength. High corrosion resistance– Titanium pipe is preferred for marine applications because of its excellent resistance to salt water. Low thermal conductivity and expansion. Much greater stiffness than either aluminum or magnesium. Operating temperatures up to 900ºF. Self sealing against many corrosives (forms titanium dioxide on its surface). Less stiff and softer than steel. Tensile strength decreases with increasing temperature (low creep strength). Flammable in powder form in regular air. Many of titanium’s cons directly affect welding, resulting in it getting a reputation as being difficult to work with. At high temperatures, titanium becomes highly reactive to chemicals in its environment. In regular air, welding contaminates titanium with carbides, nitrides, and oxides that make the weld and HAZ (heat-affected zone) brittle, resulting in lower fatigue resistance and notch toughness. In addition, chlorine from your sweat or from cleaning compounds can create corrosion on the weld. Thus, the weld and its back side must be protected from contamination to ensure a decent weld. Even friction from grinding wheels (especially aluminum oxide wheels) can develop enough heat and provide the contaminants to undermine the weld. Even given these considerations, with careful preparation, any professional welder can obtain quality titanium welds. Because contamination is a primary concern, titanium fabrication demands exacting attention to cleanliness of the metal itself and the shop environment. Often welders working with titanium along with other metals will set an area aside exclusively for titanium fabrication. For acceptable results, that area must be free of air drafts, moisture, dust, grease, and other contaminants and contamination contributors. That means machining, painting, grinding, torch cutting, and the like should not occur in the same area. Ideally, you should minimize humidity to maintain a low dew point. • Store parts in a clean, dry area, ensuring they are wrapped and sealed from the environment when not in use. That includes welding wire. • Even clean hands can introduce contamination, so use clean, lint-free gloves when handling materials. Avoid rubber gloves because they may contain chlorine. Instead, use plastic or cotton gloves. • Joint surfaces must be smooth, clean, and completely free of contamination. Weld joints and wire must be free of mill scale, dirt, dust, grease, oil, moisture, and other contaminants. Any contaminants introduced to the titanium will degrade its performance and corrosion resistance. • When preparing the surface only use a stainless steel brush that is exclusively used on titanium to minimize cross contamination from other metals. After using the brush, rinse it in alcohol and store it in a sealed container. • Use a carbide file to remove any burn marks produced by grinding or mechanical filing. Do not use a steel file, sandpaper, or steel wool, which can leave behind particles in the base metal. • Never use any chlorine-based cleaning solvent. • If you use methyl ethyl ketone (MEK), acetone, or other flammable solvent, be sure that it is completely evaporated prior to striking an arc. 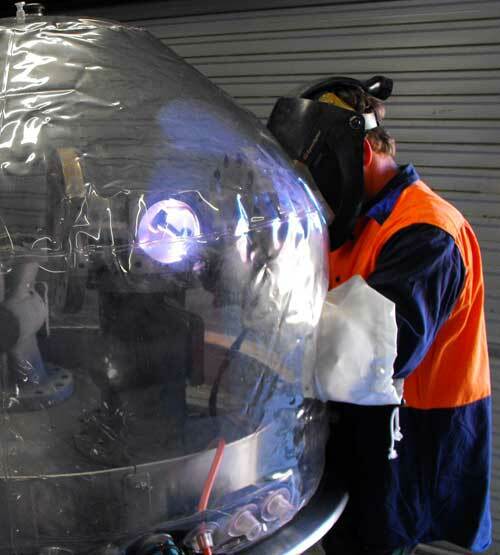 • Carefully clean materials prior to welding. Steam cleaning or a dip in a dilute sodium hydroxide solution can remove most of the previously mentioned contaminants. Even so, you will still need to perform a final decontamination to remove any residual contaminants. • Use a hair-dryer-style hot air blower to remove any, perhaps invisible, water condensation immediately before welding. Do not use the blower on flammable solvents. • To speed up the cleaning process, we recommend EZ Wipes, which are lint-free fabric wipes stored in a convenient shop canister. One side of the wipe is mildly abrasive to loosen stuck contaminants, and the other side is smooth for a final go over. The wipes are acetone-free, safe, easy to use, and disposable in regular trash with no special handling. • Clean titanium with light oxide scaling by acid pickling. A common pickling solution is 48% hydro-fluoric acid and 70% nitric acid. Metals to be welded should be pickled for 1 to 20 minutes at a bath temperature from 80 to 160°F. After pickling, rinse the parts in hot water. With heavier scaling, you may need to precede the pickling by mechanical removal or more radical high-temperature pickling. • If you cannot weld immediately after cleaning, cover the weld joints with paper or plastic to avoid recontamination. • Use carbide grit wheels for grinding. Avoid aluminum wheels that can introduce contamination. • When grinding, go slow and gentle to keep the titanium’s temperature down. Above 500oF scaling can occur. Remember titanium has low thermal conductivity, so heat will not dissipate as quickly as with other metals. Always buy your gas from a trusted supplier. The argon must be 99.999% pure to ensure the weld isn’t discolored from contamination. That’s 10 parts per million or less contamination. A perfect titanium weld looks like frozen mercury and has little or no coloration. Any blue tinting or mottling often means the argon was not pure enough. • Make sure all the leads, fittings, and supply hoses have been tested for leaks to ensure there is no oxygen contamination. Be sure to check torch insulators and O-rings for proper fit and seal. • Use a high-quality TIG/GTAW torch to minimize the likelihood of leaks. • Clamps and fixtures near titanium over 750°F may contaminate the weld. • Probably the biggest difference when welding titanium is the absolute requirement to maintain a shield on the weld’s backside on thinner materials where the back is affected by heat. With complex smaller parts, it is often desirable to use a glove box filled with argon. For larger parts, use special polyethylene purge gas chambers (glove bags). Arc-Zone.com sells a variety of these for many applications, including clamshell models to fit a variety of pipe sizes. • Arc-Zone carries a wide range of purge-gas shielding products, including purge baffles, bladders, films, and plugs. • Use an oxygen sensor or monitor to ensure the efficacy of your purge gas shield. Arc-Zone.com offers a variety of models from low-cost, hand-held ones to precision ones that detect oxygen down to one ppm. • Use a quality trailing shield attached to the trailing side of your TIG torch to supply additional shielding and protect the molten weld puddle. Generally, trailing shields require a secondary gas source and are often custom-made for a particular torch and application; however off-the-shelf carefully engineered devices produce more consistent results. Arc-Zone sells a complete line of quality trail shields and other devices. TIG Torch Materials– Here is the Difference. • Adjust the gas flow rate for optimum coverage and torch cooling without creating turbulence. • Use a 1” (25.4mm) large nozzle with a gas lens or gas flow straightener. • We offer a low-cost, high-quality alternative to trail cups and other purge welding devices called the Gas Saver Kit, which has a Pyrex nozzle 1 1/8” in diameter. It provides the ultimate in gas coverage, perfect for creating an inert atmosphere with improved gas flow to minimize turbulence. • To encourage even coverage, start the argon flowing for several seconds before welding. • The protective argon flow should remain on until the titanium has cooled below 500°F. • Too much argon flow can result in mottled or swirl patterns. Argon is denser than air, so it often flows over the surface much as water does. Where eddies occur in the argon, air can become mixed in resulting in swirl patterns. If the shielding is correct (the argon is dispersed evenly), you should see a uniform color. • Titanium discoloration is not always a problem. It indicates there might be a problem. Discoloration occurs in a sequence: straw, brown, purple, blue, dull salmon pink, and grey (with oxide flakes). Each step is more severe and likely to indicate a contamination problem. Welding codes often limit weld discoloration to straw color. Some allow a little blue discoloration in certain applications. On the welded side, light straw and even brown discoloration can be acceptable. • Some discoloration may occur beyond the HAZ. Depending on the criticalness of the weld, that may be acceptable. • To ensure a quality weld, your choice of tungsten electrodes is especially important when welding titanium. Always buy your tungsten from a trusted supplier to ensure quality, and grind your tungsten on a dedicated tungsten grinder, away from your clean welding environment. • Thoriated tungsten is often recommended for TIG-welding titanium; however it is radioactive and has raised health concerns. 2% ceriated or 1.5% lanthanated tungsten are good non-radioactive alternatives. The former is an older alternative and is only used for lower amperage DC welding applications. The latter has very similar properties to thoriated tungsten and is actually slightly easier to start and keep stable. In addition, it even lasts a little longer because its tip remains a little cooler. Despite these qualities, some outdated specifications still mandate thoriated tungsten. • Arc-Zone recommends the non-radioactive ArcTime brand hybrid tungsten electrode, formulated with state-of-the-art alloys to deliver balanced migration and evaporation rates as well as outstanding ignition and re-ignition properties. Jim is CEO and founder of Arc-Zone.com. He is a master fabricator with years of hands-on experience in his own shop and also as a winning motorcycle racer, car builder, and chief mechanic for a top motorsports team. He also has extensive experience in manufacturing, technical sales, and product development. Before launching Arc-Zone.com, he held leadership positions in some of the most respected companies in the welding industry. Under Jim’s direction, Arc-Zone.com has led the industry in product innovation and online sales and service, becoming the world’s leading supplier of high-quality, high-performance welding and metal working tools and accessories. Interesting post and thanks to tell about these informative information. Welding titanium is a specialized area of welding and should only be attempted by welders who have the necessary knowledge needed to successfully perform welds on titanium. Glad you found the information useful John! Thanks for the tips! I’m working on a project that involves welding titanium. I usually work with steel, so I’m not used to how titanium reacts to heat. I’ve noticed that it becomes discolored when I try to weld it together. I didn’t know that it becomes discolored because it indicates that there might be a problem with the metal. How can I tell that I’m getting titanium that isn’t contaminated? I need the titanium that I use to be uncontaminated so that it will look flawless after I weld it together. hi, why use the polyethylene for purge gas chambers? better than another film for welding? hi, why use the polyethylene for purge gas chambers? better than another film for welding? So your Pickling solution is 48% hydro-fluoric acid and 70% nitric acid. Thank you for your question, Steve. We don’t carry any pickling solutions at Arc-Zone. There are many excellent types of this on the market and the exact ingredients can vary; the ratios and ingredients referenced in this article are for example purposes. If you are referring to our EZ Wipes, their main ingredient is Lemonine. Pryor to welding what is the best way to cut titanium pipe to length? Does plas arc or oxygen acetylene torch jeopardize the integrity of the pipe? Thanks for the tips for welding titanium more effectively. I had no idea that you needed to had to operate at temperatures at around 900 degrees Fahrenheit — that is hot! Maybe I will leave the welding to the professionals who know what they are doing and seek out a professional to do some welding for me. Thanks again for the help! Hello JW, good post. Do you know where we can get photos of Welded titanium with no discoloration ? We are members of ITA (international Titanium Association) and need some for upcoming conference. Happy to pay and attribute source. I’m sorry that we didn’t see your message until after your conference had begun. EMail us at our info(at)arc-zone.com, and perhaps we can hook you up with some leads on great images for the future. My workplace is getting a custom welding job on some titanium supports in our new building, and it’s interesting to learn what goes into welding a material like that. It’s good to know that there should be absolutely no contaminants on the titanium, and I’ll make sure that my boss knows to ensure that the welders we hire include services to prepare the materials beforehand as you suggest. I was also hoping to be able to watch the process, but if there is going to be molten titanium in the air, then it’s probably best that I just stay out and let the professionals do their job.